What Is 3D Printing Titanium? 3D printing with metals is still a new process; however, as the machines and materials continue to drop in price it will become more adopted by different industries for similar use cases. One of the most desired industrial quality metals is titanium due to its lightweight, high strength, resistance to corrosion, melting point properties. It also a great material for osseointegration or formation of bone tissue on an implant surface. Wall Thickness: The minimum thickness of a ‘wall’ of your 3D model can be as low as 0.4mm! For most of our materials this value typically is in between 1 and 3mm: for ceramics it is even 3-6mm. To be on the safe side, we’d suggest you nevertheless to stick to a minimum wall thickness of at least 1mm for titanium prints (especially if you plan to make something small such as the band of a ring). Detail Size: Thanks to our DMLS printers, you can go into a very fine level of detail. The distance between the wall of your model and the surface of a detail can be as little as 0.25mm! Dimensional Accuracy: Due to heating and cooling processes in the titanium, a 3D print can be slightly bigger or smaller than your original design intended. However, DMLS is by far the metal 3D printing process with the highest dimensional accuracy. With titanium, dimensional accuracy is generally better than 2% for outer dimensions. 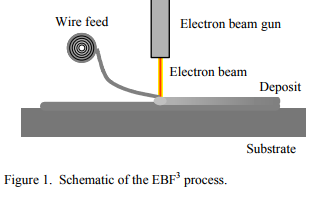 Another popular process used is EBF or Electron-beam fabrication. speed, wire feed rate, and laser power. There also is a trade-off between high deposition rates and the quality of the grain microstructures. The quality of microstructures affect the tensile properties and the resistance to fatigue, fracture, and crack propagation. With 3D printing, there can be a fair amount of trial and error; however, there are some common design obstacles documented and understood. It’s important for engineers to know about this obstacles even before designing the CAD models. There is also variation in different 3D metal printers; the laser spot size and translation speed are essential to knowing. The design obstacles that should be understood are part orientation, porosity, density, and deformation. 3D printing creates parts with anisotropic properties, which means they have different mechanical properties in different build directions. Some of the available free gcode software can let you change the print shape of each layer such as honeycomb, linear, star, triangle, and more. The parts have higher tensile strength in the X and Y direction than they do in the Z direction. Hence, part orientation needs to be considered before printing, and the designer must pay attention to where certain areas will sustain stress. The general rule of thumb is to not design a gap or hole under 0.5 mm as well as overhangs should not extent more than 0.5mm (with no support structure) and its good practice to use chambers (or at least fillets) on overhanging features. Support can be used to create elaborate overhangs and holes, but the designer must be mindful of the moments and stresses on those features after the support is removed. While 3D printed structures are optimized for their weight, the designer must be mindful of porosity leading to cracks and accelerated fatigue. This occurs when very small cavities form within the body of a part as it is being printed. The 3D printing process itself or the powder used can cause the small cavities. The particles may not fuse correctly when there is not enough powder or when the laser intensity is too low; however, spatter ejection can occur when too much power is used. The best way to avoid these problems to buy certified material and tune the machine parameters of power, spot size, and spot shape for a given material and print job. The porosity is inversely related to density; for load-bearing applications, a density of above 99 percent is required resist fatigue or cracking under pressure. There is a tradeoff between density and build time; the bigger particles reduce the build time, and the density of the part, as well as, the smaller particles increase the build time and density. Volume flow rate also affects the density of the part. A constant volume flow rate will allow for an evenly distributed part; a variable flow rate will increase the porosity of the part. Cracks in structure expand exponential, that why porosity and density are so important with powder-based processes. It is hard to predict the creep or deformation in a non even distributed part. If the part in purposed for functional use, the effects of expansion and contraction must be anticipated. Expansion and contraction can be due to high stress or temperatures that cause the residual stress to exceed the tensile strength of the part during and after the build. During the build, the highest magnitude of stress is found at the edge of the material and the build plate. The hot material is going to curl away from the build plate which creates a tensile stress at the edge and a compressive stress in the middle. Even if the part remains adhered to the build part, the stress can deform the part due to the unloading of the stress. A substrate is added to the top layer of the build plate to reduce this effect, but the high-level way to reduce this temperature-educed stress is to reduce the temperature range of the material. Besides modifying the laser length and distribution, the material can be heated before its hit with the laser to reduce the temperature difference of operating process. The support structure and proper part orientation can help reduce the deformation by strengthening the part during the build; however, the excess support material can absorb the heat needed to fuse the particles together (increasing the porosity of the material). Engineers can optimize the shape and build process of the support structure for each build by formulas or the method of trial by error and most of the metal printing research has been focused on reducing deformation of the printed material. Now having talked about the problems with metal printing, it’s important to highlight the advantages of creating a metal printed part. With all of these advantages, why don’t more companies implement these systems? The 3D printing services are facing enormous inertia with traditional manufacturing; companies already have processes and training done for traditional machines. There is a learning curve that will have to be overcome before 3D metal printing can reach its full potential. Metal printing is much more complex and requiring more design training than plastic printing. Metal printing’s current target is creating low volume complex parts that need to be strong and lightweight. For other parts, other manufacturing processes are more cost-effective and faster. There will be hybrid additive/subtractive machines (such as DMLS and CNC machining) as to print a rough draft of the product and refine it with the subtractive process as well as create complex geometries on subtractive parts. The key to metal printing’s adoption will depend on widespread design knowledge and cost of 3D printing. I attended a wonderful talk put on by GABA (German American Business Association) on 10/11/17 about how 3D bioprinting’s ability to print precise, complex and individual features has opened new roads for medicine. The speakers shared the current efforts to create organs and tissue and what the future has in store. The presentation including a diverse panel of six speakers, Dr. Jenny Chen, MD, Dr. Melanie Matheu, Dr. Mayasari Lim, Dr. Nabeel Cajee, DDS FICOI, Tom Anderton, who each explained the impact of bioprinting in industry, academia, education/global outreach, and patents. Founder/CEO of 3DHEALS is trained as a neuroradiologist, and her company is focusing on curating healthcare 3D printing ecosystem. Her main interests include medical education, 3D printing in the healthcare sector, and artificial intelligence. She is also a current adjunct clinical faculty in the radiology department at Stanford Healthcare. She was also the event’s moderator and lead each Q&A section with each speaker as well as an open panel Q&A at the end. Founder and CEO of SE3D, a startup focused on next-generation bioprinting tools for accelerating research and education in the biomedical and biotech fields. Previously, she was a professor in Bioengineering at Nanyang Technological University (NTU), a top engineering university in Singapore. Her research expertise included stem cell engineering, bioprocess design, bioprinting and tissue engineering. She is greatly passionate about training next generation minds for the future of bioprinting. She currently teaches at the Fung Institute for Engineering Leadership at UC Berkeley. Her background obtained her Ph.D. degree in Chemical Engineering at Imperial College London and her BSc in Chemical Engineering at UC Berkeley. She believes the future outlook of 3D bioprinting will be used for creating personalized medicine, drug screening, tissue replacement and future organ transplant. She hopes to accelerate the future of bioprinting by offering educators an affordable bioprinters, coupled with comprehensive curriculum and laboratory teaching materials to trigger research and exploration. She began the event with describing the three main ways of achieving bioprinting: laser-assisted bioprinting, inkjet bioprinting, and microextrusion bioprinting. Below are videos showing the various processes. She pointed out the obstacles and tradeoffs in the bioprinting process; mechanical properties versus the biological interaction of the cells printed as well as the post-processing of bioprinting. The process of placing down the cells was the easy part, keeping the cells alive and maintaining their intended purpose in the structure was the difficult part. There are chemical, physiological, biological, mechanical, and cell to cell interaction that must be monitored. These factors can be influenced in a controlled environment by adjusting the temperature, pH, humidity, and other factors as well. This monitoring is critical to understanding how bioprinted structures can be suitable for the real world environment. 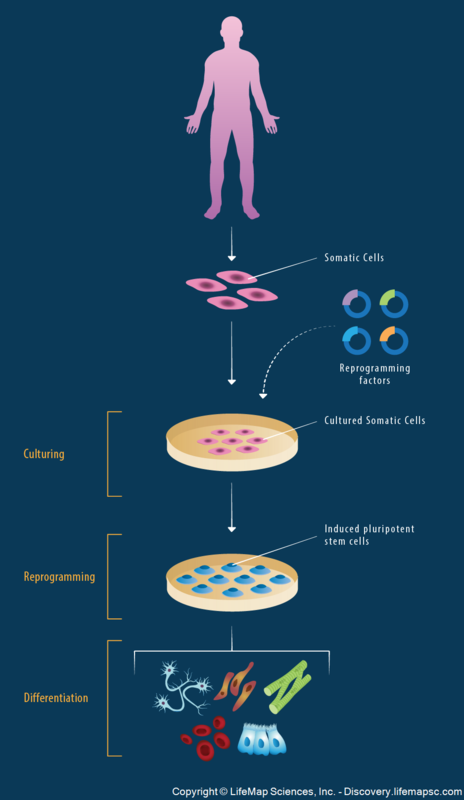 She also explained the obstacle of iPS reprogramming factors to make sure the cells had specific tasks to perform when they were printed since it is hard to program the cells to do what they do. Co-founded Prellis Biologics in October 2016, with the mission to create fully vascularized human tissues and organs from transplantation. She orchestrated a cross-pollution solution of laser technology at the center of her Ph.D. thesis with biology to creating the tiny blood vessels, known as microvasculature, necessary for tissue engineering applications. Without microvasculature, organs are starved of oxygen and nutrients. Dr. Matheu brings her multi-disciplinary experience in specialized laser microscopy, cell biology, physiology, and biophysics to build microvasculature and additional layers of tissue with near instantaneous speeds and single-cell precision. Consumer grade bioprinters do not have the resolution to print microvasculatures required for tissues and organs. They have a high resolution holographic 3D laser that very similar to 3D lithography. Hopefully, in the near future, consumer-grade bioprinters will be able to reach the resolution and precision needed to create the tiny blood vessels and Prellis’s process becomes more streamlined so they can make a dent in the global organ shortage. Dr. Cajee is a comprehensive dentist with an interest in advancing implant prosthodontics as a clinician, innovator, and educator. Dr. Cajee is a member of the faculty at the University of the Pacific School of Dentistry in San Francisco and the Dental Ambassador of 3DHeals. He is a recognized Fellow of the International Congress of Oral lmplantologists and the American Academy of Implant Prosthodontics. He also spent time researching in the Pacific Angiogenesis Laboratory. Dr. Cajee hopes 3D/Bioprinting will unlock creative and deliverable therapies for better patient outcomes. 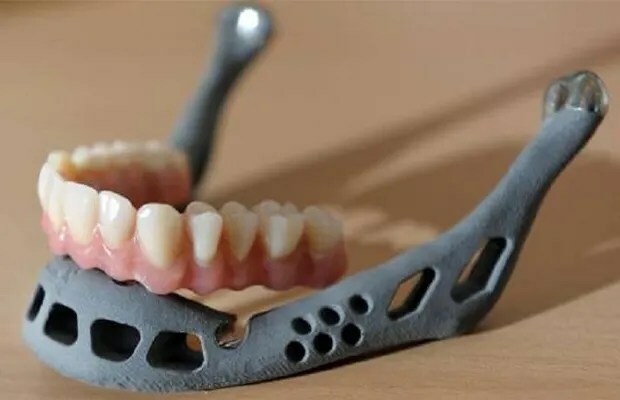 He highlighted the FDA’s clearance for implantable 3D printed titanium may allow his practices to eliminate inventory of stock implants and parts and create personal products to the patient’s need. He emphasized dental technology is transitioning from closed systems of technology that is formulaic in process to open systems which may unlock creativity and lower costs; he believes 3D Printing and Bioprinting (in-time) will open up possibilities to advance dental treatments and expand access to care. He also noted the use of platelet-rich fibrin (PRF) in many dental surgical procedures such as tooth extractions, dental implant surgery, and bone and gum augmentation. Dr. Cajee has documented cases of patient’s not needing to take medications after tooth extractions and implant surgeries due to the accelerating healing properties of PRF. With PRF, fibrin, growth factors, and white blood cells are taken from the patient blood. Since they are from the patients own blood, they are not rejected from the body, rather speed up the healing. The process is the blood is drawn before the procedure normally while the patient is getting numb for the surgery. The blood is then put into a centrifuge at 2700 rpms for 13minutes. After 13 minutes, the blood is separated into three layers – 1) clear liquid or plasma layer 2) red layer rich in red blood cells 3) yellow thick layer which is the PRF layer. Tom is currently at Squire Patton Boggs, he was formerly General Counsel, Secretary at Zonare Medical Systems and Vice President, Intellectual Property & Legal Affairs at Presidio Pharmaceuticals where he oversaw the legal function at Presidio. Before Presidio, he was the Associate General Counsel and Chief Patent Counsel at Monogram Biosciences, Inc., where he built Monogram’s IP portfolio. In the talk, he shared the history of patents related to 3D printing and bioprinting, the expiration of important patents in the additive manufacturing industry after 2009 have enabled the expansion of 3D printing into many different technology areas. While 3D printing is well underway for dental and prosthetics, significantly reducing time and costs of production, one of the most exciting developments is the possibility for bioprinting of tissue and organs. It will be interesting to see how bioprinting further impacts industry, academia, education/global outreach, and patents. This is a summary and reflection about creating a purely mechanical artificial heart in my Junior Capstone class. Kimberli Graham, Adam Goodwin, Isaac Need, and I finished first place award for our project. 4D printing is printing 3D objects that can assembly into another object or preform a reaction to certain conditions. However, the objects need a catalyst to perform their transformation such as water, temperature, light, or other factors. One major player in this movement, who coined the term “4D printing” and created the Self-Assembly Lab, is Skylar Tibbits. He along with Stratsys’s R&D departments and the Connex 3D printer have made important progress in this field. This video clip of a self folding cube by the Self-Assembly Lab shows what can be done within the field of 4D printing. There are more videos from the lab located here. He saw what nanotechnology was changing in medicine and he is applying the same idea to infrastructure and manufacturing. He isn’t looking to create smart materials that replace designers and engineers, but rather create “programmable materials that build themselves.” It will be interesting to see more to come from this field. Max Murphy is Mechanical Engineering student in his Junior year at California Baptist University. He is interested in the implications of 3D printing or positive manufacturing for mechanical design. In the summer he is was an intern with Soundfit, one of the companies that is part of the Bay Area Advanced Manufacturing Hub (BAAM), where he is gained hands on experience with a 3D printer and scanner. He was also an intern with Neodyne Biosciences working with the R&D and Q&A departments. Biomimicry is a approach to design that mimics specific systems or processes found in nature. It has been around a lot longer than 3D printing. The collage depicts several innovative designs that are directly based on certain properties found in nature. For example, Speedo’s Sharkskin swimsuit uses a counter-intuitive approach to reducing drag with a rougher surface that slightly increases turbulence. 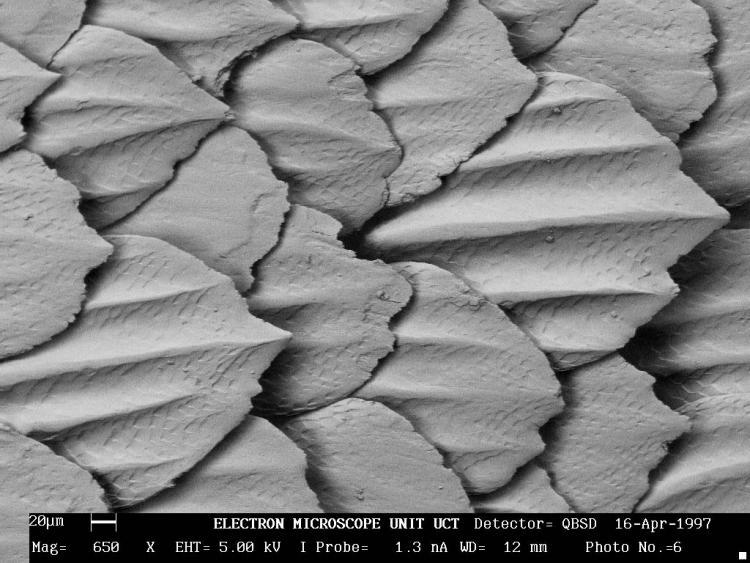 It’s modeled on the denticles on the surface of a shark’s skin that allow for faster movement than a completely smooth surface. The dimples on a golf ball have similar effect. 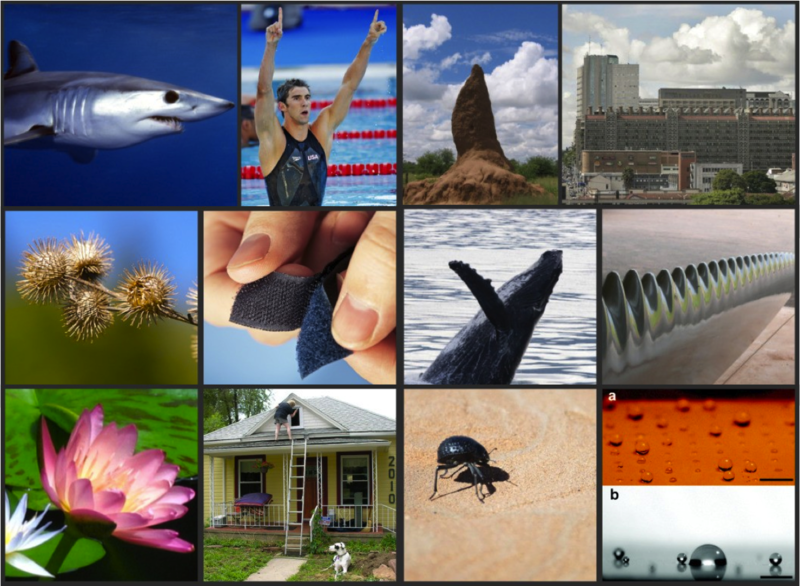 The slide show, 7 amazing examples of biomimicry, goes through them in better detail. Also see the slide show titled “14 Smart Inventions Inspired by Nature: Biomimicry”. The Shinkansen Bullet Train is another great example of basing designs off things found in nature. One of the problems with the Shinkansen train was the great loud noise that was created by the friction between the air and the train’s body. Kingfishers move quickly from air, a low-resistance (low drag) medium, to water, a high-resistance (high drag) medium. The kingfisher’s beak provides an almost ideal shape for such an impact. The beak is streamlined, steadily increasing in diameter from its tip to its head. This reduces the impact as the kingfisher essentially wedges its way into the water, allowing the water to flow past the beak rather than being pushed in front of it. Because the train faced the same challenge, moving from low drag open air to high drag air in the tunnel, Nakatsu designed the forefront of the Shinkansen train based on the beak of the kingfisher. 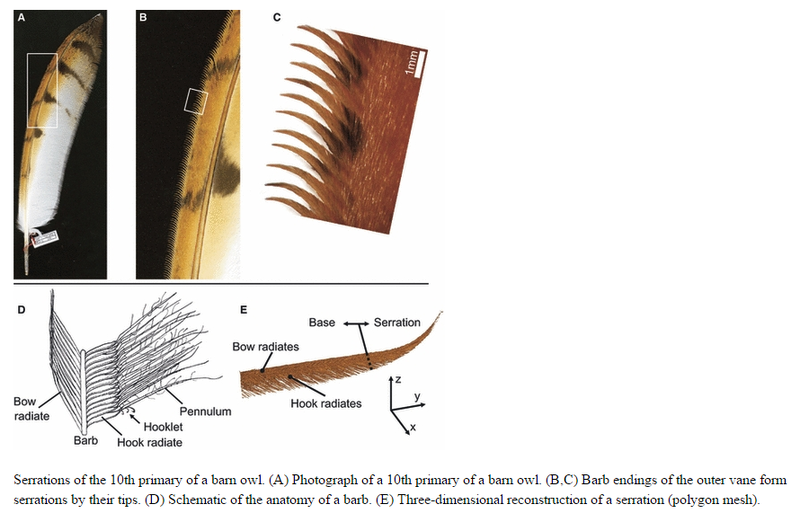 This image is taken from “The three-dimensional shape of serrations at barn owl wings: towards a typical natural serration as a role model for biomimetic applications” by Thomas Bachmann and Hermann Wagner, a great article that goes more in depth into the science behind the serrations on the feather. The designers used what they observed in nature and applied it to the train to solve their problem. Since writing her book, Biomimicry: Innovation Inspired by Nature, Janine Benyus has become a major figure in the Biomimicry movement by also co-founding the Biomimicry 3.8 and the Biomimicry Institute. Janine Benyus shares a lot of her thoughts and predictions in her one of a few TED Talk which is a great talk if you haven’t seen it already. Biomimicry will continue to influence modern 3D printing design principles; not because it is something new, but an approach that has been already applied to many fields.